Instead of hanging out by the wall outlet, maybe you should invest in a handy battery pack? 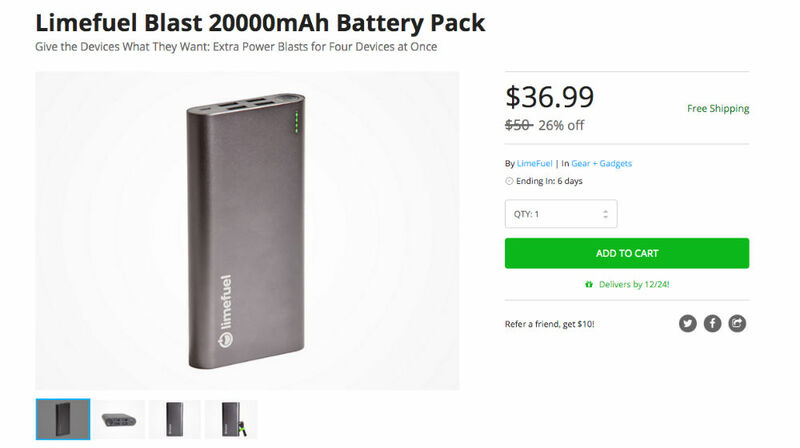 On the DL Deals Store, you can purchase a Limefuel Blast 20,000mAh Battery Pack for just $37, down from its usual price of $50. This battery pack allows owners to charge up to four devices at once, all coming with their own LED indicator lights. Thanks to 2A input, charging times should be decreased, meaning less time charging, and more time using your phone as you normally would. And with “premium” aluminum casing, this battery pack should be able to handle drops and mishandles with ease. Check the full feature list below.